Miss Hickory is a small doll, made of twigs and a strong hickory nut. She has lived, up until now, in a corncob house near the Old Place, the house in New Hampshire where Ann, the little girl who made her, lives. When Ann goes away to school, however, it becomes clear that Miss Hickory will not be spending the winter inside on the windowsill as she has done in years past, and she sets out to find a new home. With the help of such friends as Crow and a cat named Mr T. Willard-Brown, she begins to explore new lodgings, and by extension, the larger world around her, resulting in a variety of adventures. 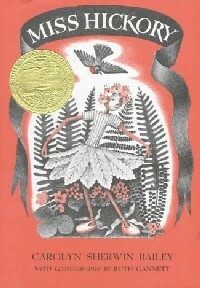 In a word, I would describe this 1947 Newbery Medal winner as charming. I read it aloud to my five-year-old and three-year-old together, and they loved the animal characters and the involvement of the natural world in the story. They were captivated by the beautiful description of the way the animals commemorate Christmas and they enjoyed the different personalities of the animals Miss Hickory meets. There is some death and sadness in the book, but my girls were completely fine with it. (I'm about to vaguely spoil a couple of things, so skip the rest of this paragraph if you don't want to know!) A deer loses his mother to hunters at one point, but the death is handled subtly, and none of us shed any tears. (It was not a dramatic Disney parent death a la Bambi or The Lion King.) The deer also gets an immediate happy ending, so the sadness only lasts for one chapter. My daughters were equally unbothered by Miss Hickory's "death" near the end of the book, which is clearly more of a transition than a true loss of life, since Miss Hickory is always understood to be a toy, not a human being. I have read some Goodreads reviews that really condemn this book because of the ending, but personally, I found it refreshing that the author didn't shy away from what strikes me as a very logical ending for one whose head is a nut. This read-aloud was also noteworthy because I experimented with doing voices for some of the characters. I did voices for Crow, Hen-Pheasant, and Squirrel, and used my own "story time voice" from my library days as the voice of Miss Hickory. The girls seemed a little taken aback at first because I typically don't do voices, but they seemed to enjoy the change of pace. I did wish some of the chapters had clearer transitions between them, as the narrative does jump around quite a bit between different animals and sometimes it took almost an entire chapter to figure out how an episode connected to the overall novel. I also found myself wishing for more references to the human beings in Ann's family, but that is probably because of my own preference for stories set in the real world, and not necessarily because the book needed more of such scenes. I'm not sure every preschooler would react as casually as mine did to some of the events in this book, but if you have kids who have been exposed to a wide variety of stories, including fairy tales where deaths occur, and they're not especially sensitive to sad topics, I wouldn't assume this book is too much for them. It's a fantasy story set in what could very well be any child's backyard and it feeds the imagination with ideas of what might be happening while we humans are going about our mundane daily activities. I'll be curious to see how this compares to Hitty: Her First Hundred Years by Rachel Field, another Newbery winning doll story which I've just started reading to my five-year-old.